New York is home to plenty of fantastic attractions and sights to see no matter the time of year. However, Christmas in New York is a special treat that both residents and visitors are encouraged to enjoy. Make sure you visit at least one of the places below during your Christmas tour in the Big Apple. If you are in New York for the Christmas season, don’t miss out on the hottest Christmas show around. Radio City Music Hall hosts the Radio City Christmas Spectacular. The famed Rockettes deck themselves out in holiday gear and leg-kick their way right into your heart. The ladies dance in unison with jaw-dropping precision on a stage featuring magical Christmas décor. Enjoy all of your favorite seasonal memories as the spring to life before your very eyes. From reindeer to wooden soldiers and everything in between, you will have a memorable experience. Have the time of your life whether you attend the show on your own or with others. Make sure you book your tickets well enough ahead of time, too. 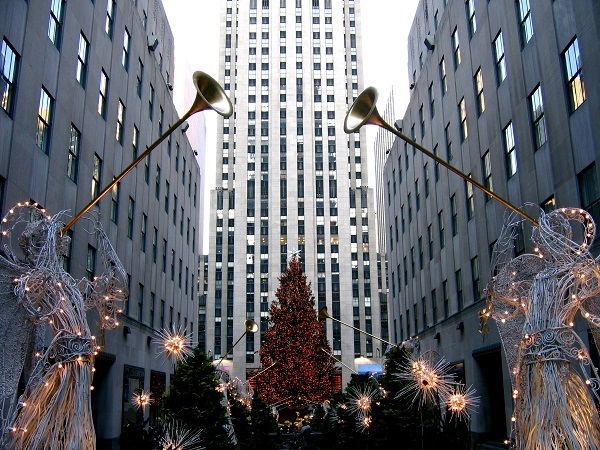 A trip to New York during the Christmas season is never complete unless you visit Rockefeller Center. The Rockefeller Christmas Tree is a magnificent sight for individuals of any age. Although located in the Big Apple, the tree serves as a worldwide symbol to celebrate the miracle of Christmas. People come out in droves to enjoy the sight of the massively lit tree. If you plan to attend the tree lighting ceremony, make sure you arrive well enough ahead of time. The streets and sidewalks often fill with thousands upon thousands of people. Both residents and tourists alike make their way into the city to enjoy the spectacular event. Of course, if you miss the lighting ceremony, you can still enjoy viewing the tree up until early January. Rather than stopping at a particular location on 5th Avenue, take the time to stroll along the sidewalks. The store lined along 5th Avenue go out of their way to provide some of the unique Christmas window displays. Nothing inspires such holiday cheer than seeing incredible displays all beautifully lit up. You are sure to see something different from each iconic store. Christmas décor ranges from dazzling Swarovski crystals to eye-catching glitz and glamor. For instance, the Bergdorf Goodman display may feature brilliantly shiny gifts or ballroom scenes. Either way, it is a feast for your eyes that you do not want to miss. Take your time so you can enjoy the full effect of each and every display. Union Square is a favorite hotspot any time of the year. However, it is particularly popular during the Christmas season. Make sure you head to Union Square between mid-November and Christmas Eve to enjoy the Union Square Holiday Market. Several vendors line the square, all of which provide unique and beautiful handmade gifts. Aside from the diverse experience and the one-of-a-kind gifts, you can also enjoy live music. Children can participate in a craft studio, which provides them with a memorable and magical hands-on experience. Last, but certainly not least, head to Dyker Heights in Brooklyn to see the Dyker Heights Holiday Lights. The residents in the area go out of their way to create the most amazing display of lights and holiday décor. Although the residents to not consider it a competition, it would certainly seem that way. Just when you think it can’t get any bigger or better, it does. Each year the displays grow larger and brighter than ever before. You can enjoy the Dyker Heights Holiday Lights via walking, bike, or bus tour. Either way, make sure you have your camera ready to document the incredible sight. Whether you choose to visit all or some of the places on the list above, you won’t regret the experience. You can enjoy each of the holiday locations mentioned above without spending a dime. However, you may want to keep funds on hand in case you spot a must-have gift. Most importantly, make sure you take the time to soak in the magic of NYC’s Christmas season.